Seiun Kamen Machineman (Nebula Mask Machineman) was a Japanese tokusatsu series exhibited in Japan during January 13 until September 28, 1984, telling the adventures of Nick, a.k.a Ken Takase, a college student from the Ivy planet (located at the Pleiades) to study the behavior of the Earthlings. Brought to You by the Letter "S": M for Machineman. By the Power of Grayskull! : DOLPHIN!!! Cool Car/Cool Plane: The Machine Dolphin, which can change to the Dolphin Jet. Clark Kenting: Like Superman, Nick comes from a different planet, goes under the name of Ken Takase as a civilian, and as Machine Man. But he doesn't fly though. 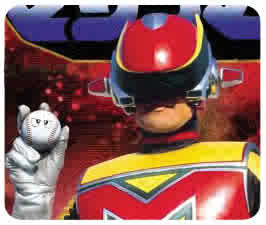 Improbable Weapon User: Machineman uses his sidekick, Ball Boy as an actual baseball to stun enemies. Merchandise-Driven: The DX Machine Dolphin is still a highly sought collectors' item. Robot Buddy: Ball Boy for Nick/Ken. Thou Shall Not Kill: Machineman only subdues the Battle Butler and use his power to make them HeelFace Turn. Zorro Mark: His finishing move.